Young Iranian male and female karate practitioners have got off to a promising start at the 15th edition of Asian Karate Federation (AKF) Cadet, Junior & U-21 Championship in Indonesia, and got a total of eleven medals. On Friday, Iranian karateka Mobina Heidari received a bye in her opening round fight of the female cadet over 54-kilogram kumite contests at the Celebes Convention Center in the southern Indonesian city of Makassar, before overcoming opponents from China, Taiwan and the host nation to deservedly clinch the gold medal. 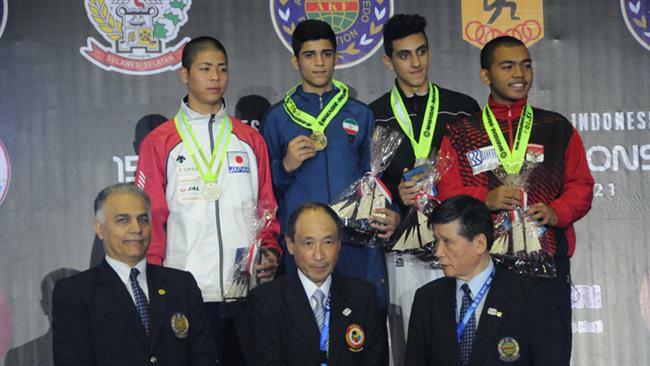 Navid Mohammadi also emerged victorious against representatives from India, Indonesia and Japan in the male cadet over 70-kilogram division, and collected another gold medal for the Islamic Republic of Iran. In the junior individual kata division, Iran’s Fatemeh Sadeghi prevailed over Malaysian and Kazakh rivals in her first two competitions, before conceding defeat against the Japanese counterpart in the final and winning the silver medal. Additionally, Leila Borjali failed to surmount a Japanese karate practitioner in the final challenge of female cadet minus 47-kilogram kumite division, and finished in the second place. She had earlier trounced rivals from Sri Lanka and Uzbekistan in the battle for the title challenge. Atousa Rezaei pocketed the third silver medal for Iran in the female junior kumite over 59-kilogram section. Rezaei routed her Chinese and Japanese rivals as she progressed to the final competition, where she lost to a representative from Kazakhstan. Moreover, Yeganeh Shahpari in the female junior individual kata, Shaghayegh Vahedi in the female junior minus 53-kilogram kumite, Hossein Saleipour in the male cadet minus-63 kilogram kumite, Morteza Ne’mati in the male cadet minus-52 kilogram kumite, Mehrdad Mostahsan in the male cadet minus-57 kilogram kumite, and Sara Bahmanyar in the female junior minus 48-kilogram kumite contests managed to earn six bronze medals for the Islamic Republic of Iran. The 15th edition of AKF Cadet, Junior & U-21 Championship started in Makassar, Indonesia, on November 21, and will conclude on November 27, 2016. The continental tournament has attracted some 400 male and female karate practitioners from 24 Asian countries, including China, Chinese Taipei, India, Indonesia, Iran, Japan, Kazakhstan, Sri Lanka and Uzbekistan.